Arrived into London on the night of Thursday, 4th November 2010 - one day prior to the arrival of the Captain's Choice Group coming directly from Australia. Spent a very brisk Friday walking through Kensington Gardens (adjacent to our hotel) and going to Oxford Street for a spot of retail therapy. On Friday night, we enjoyed a Welcome Dinner in a restaurant close to our hotel - at which we were advised that Mali was a 'NO GO' due to a British Government "Do not Travel" warning for all of Mali, as opposed to "Do not Travel" warning for Timbuktu. At this dinner, we were advised that the substitute for Mali and Timbuktu was to be Marrakech, Morocco. The following morning (Saturday), we were bussed to Luton Airport to join our charter aircraft, which was to be "home base" for the next 3 weeks. 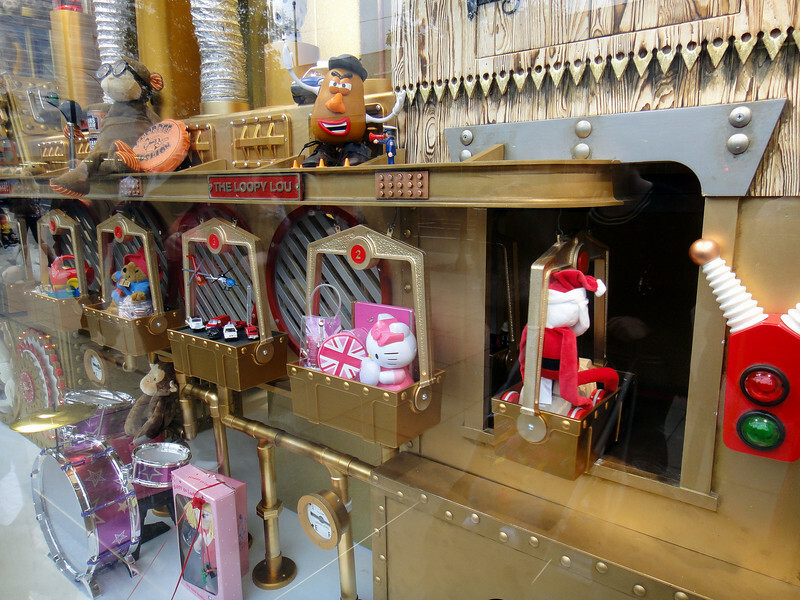 Toy window display in Oxford Street.